Are you ribbing me? Today we’re looking at one of the biggest trends for next season…. If you type the word “ribbed” into the Topshop website it comes up with 269 results – which is a sure sign that ribbed clothes are going to be huge this season – or next season – whichever way you look at it. From ribbed cropped tops, to ribbed cropped trousers and from ribbed jumpsuits, to ribbed swim suits anything and everything is ribbed. One of the easiest ways to wear ribbing is as a layer underneath something else. A ribbed top would work fantastically well under a faux fur gilet or suede waistcoat (fringing isn’t compulsory) with just the sleeves peeping through. I recently bought this jumper from Topshop (£28) which I will layer under all sorts of things when the colder weather arrives. The other great thing is that it will add warmth without lots of bulk. Long line cardis are a huge trend for the season and buying into a ribbed one of these isn’t so much as buying into a “look” as adding a cardi to your wardrobe, which just happens to be ribbed. Given the fact that they can be quite fine knits, it’s necessary to watch what peeps through from beneath – jeans for example can leave bumps where the buttons are. Leather leggings would give a smooth silhouette. Another offering from Topshop is this cardi, for £39. 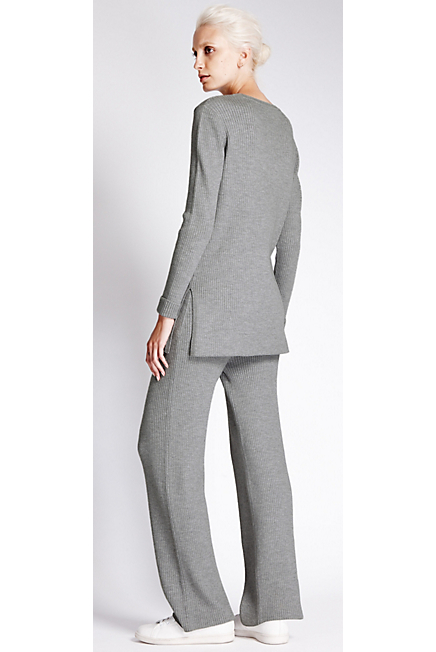 For anyone who fancies it, ribbing can be embraced as a full on look in many ways, from a jumpsuit to a dress. 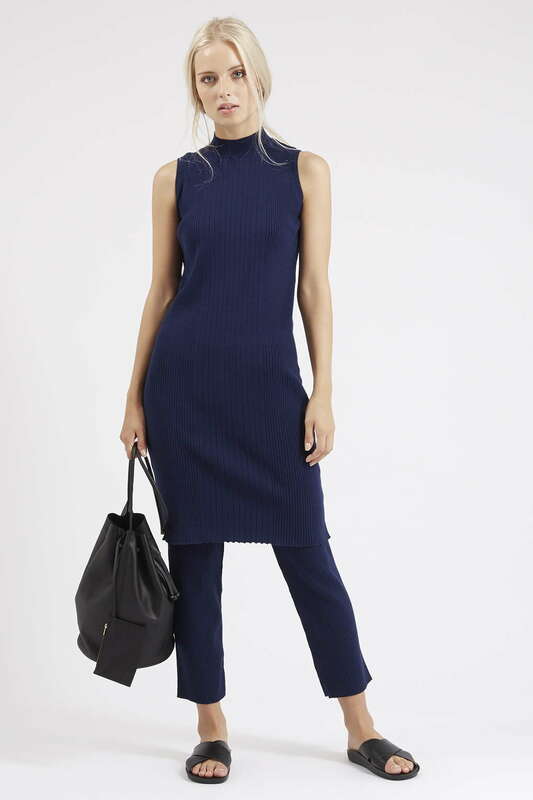 I love this two piece outfit from Topshop (£78) which comprises ribbed cropped trousers and a long line tunic. Or Zara has this ribbed dress (£15.99) which reminds me of Kate Moss in her early modelling days. See what I mean about the 1990s? Autograph at Marks and Spencer has this two piece ribbed dress and long line cardigan in olive. Somehow, seeing the outfit on a more mature model makes it easier to relate to as a trend. The cardigan is currently sold out and the dress is available in limited sizes, presumably because it has featured in Vogue. Not so good for us but I’m happy for M&S! Each piece is priced at £55. And another little gem from Autograph – this fabulous ribbed jumper and trousers ensemble. Now if I could wear this from October until April – and look as good as the model in doing so, I wouldn’t mind winter approaching. 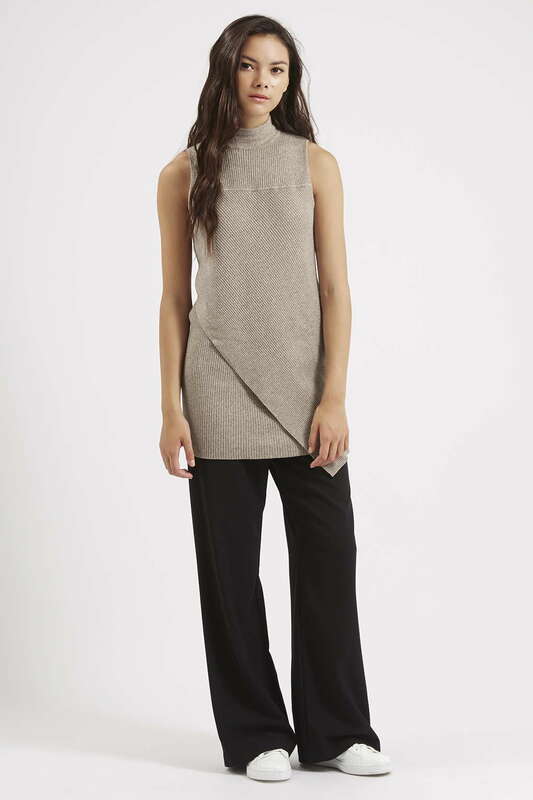 The tunic top is £49.50 and the trousers are £45. Or maybe try a jumpsuit? Zara has this great option. Yes? No? Maybe with a white shirt underneath? ?